2019-2020 enrollment forms are available under student information! 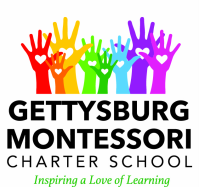 The Gettysburg Montessori Charter School (GMCS) is a FREE public/charter school open to students from any school district in Pennsylvania. Our charter school allows Montessori education to blend with traditional elements to bridge the gap between public school and private school. Montessori emphasizes the development of the whole child: cognitive, social, and emotional, while the charter aspect requires state testing for peer monitoring and learning measurements. Children in a Montessori class learn through hands-on activities while teachers facilitate. Click here for frequently asked questions regarding school meals. To sign-up for free/reduced meals click here. To register for our online parent payment portal click here.